Lightly toast the nuts in a small toaster oven for 2-4 minutes. Keep watch on them, because they can burn quickly. Set aside. Cut the oranges into sections by first cutting the top and bottom peel off. They cut the peel off around the sides of the orange. Cut each segment out of the orange. Set aside. In a large serving bowl (I like a wooden salad bowl) place the mixed greens. Top with the raspberries, chunks of goat cheese, and oranges. Serve with dressing. For the dressing: combine 1/4 cup white zinfandel, 1 tablespoon orange juice, 1/3 cup canola oil, 2 teaspoons raspberry vinegar, 1 shallot, skin removed, 1/2 teaspoon sugar, 1/4 teaspoon white pepper, and 1/4 teaspoon salt, plus more to taste if desired in a small food processor or blender. Puree until smooth and blended. Serve with salad. Dressing keeps in the refrigerator for up to 1 week. I've always associated lettuce salads with summer. They seem to be the essence of summer to me. Salads are cool and crisp. They don't heat up the oven. And because they're quick to prepare, a big salad is often a go-to recipe for me after a long day of being outside in the heat. Summers just seem to be busier and salads fit the bill because they don't often dirty up a bunch of pots and pans. That was all before my foray into backyard gardening. Now I realize that lettuces, spinach, arugula, and other greens are all actually spring vegetables. They thrive in the cool temperatures of spring. In fact, summer heat can cause them to grow too quickly. Head lettuces will be tall and lanky instead of growing into nice round heads of lettuce. I'm trying to keep all this in mind as I garden and eat more with the seasons. There are plenty of warm spring days that deserve a fruity green salad. 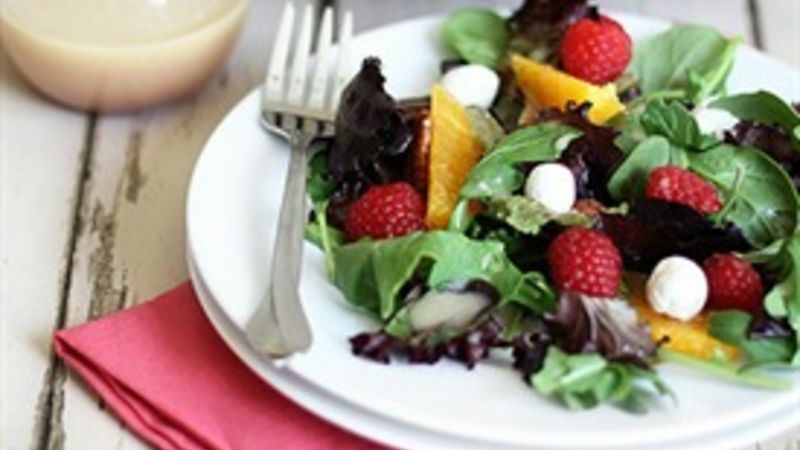 Spring is the tail end of orange season and while, raspberries aren't considered a spring fruit in most states, you can use high quality frozen berries in this salad as well.